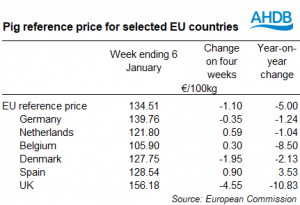 EU pig prices have recorded little movement in the past four weeks, with the EU average reference price standing at €134.51/100kg in the week ended January 6. Compared to four weeks earlier, this is a decline of €1.07 and €5 below the same week of 2018. This steadiness could be a reflection of the uplift in demand reported just prior to Christmas, and then the subsequent holiday period. Across the different major producing countries the results were more mixed. 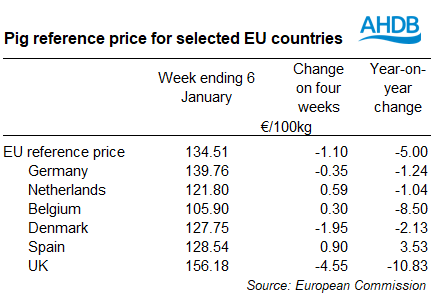 The UK pig price continued to fall at a faster pace throughout December (partly due to a weakening pound) and so the gap between the UK price and the overall EU reference price has narrowed to €21.67/100kg. In mid-November, the difference had been in excess of €30/100kg. This may provide some relief from import pressure, and the significant competition from low priced EU pork reported in late autumn. However, it remains to be seen how EU prices will fare in the coming weeks, with current reports suggesting demand is very weak.